Following a week off, West Indies Professional Cricket League (PCL) resumed with three fourth round matches. Trinidad and Tobago Red Force visited Jamaica Scorpions, Guyana Jaguars hosted Barbados Pride and Leeward Islands Hurricanes traveled to Winward Islands Volcanoes. At Sabina Park Scorpions made light work of Red Force. Jamaica 314 all out; Andre Mc Carthy 82, Brandon King 78, Roshon Primus 3/32, Jason Mohammed 2/16, Sheldon Cottrell 2/42 and Imran Khan 2/74, and 229 all out; Jermaine Blackwood 81, Imran Khan 5/50 and Jon-Russ Jagessar 3/78 beat Trinidad and Tobago 206 all out; Jason Mohammed 91 not out, Kyle Hope 64, Damion Jacobs 4/61 and Nikita Miller 3/53 and 205 all out; Imran Khan 52, Kyle Hope 35 and Nikita Miller 9/41 by 132 runs. Windward Islands Volcanoes recovered from 47/7 in the first innings to post 291 with captain Liam Sebastien unbeaten on 80 supported ably by Delorn Johnson 56 batting at number 10 and Mervin Matthews 73 batting at number 11. Gavin Tonge led the early rout for Leeward Island Hurricanes with 5/56 supported by Alzarri Joseph 3/67. 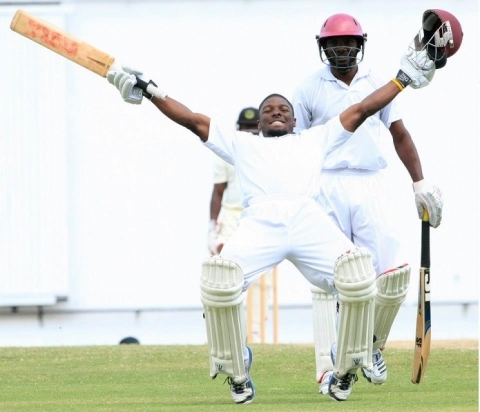 Leewards responded with 259 with Jahmar Hamilton 94 and Montcin Hodge 76. Bowling for the Volcanoes Shane Shillingford scalped 5/96 and Sebastien 4/78. Windwards declared on 333/8 with Tryone Theophille (95) and Sunil Ambris (91) missing out on the century milestone. Tonge follow up his first innings form with 3/43 while Rahkeem Cornwall got in the act with 3/105. Jahmar Hamilton made up for his near miss in the first innings blasting 125 off 134 balls as he fought to keep the Hurricanes in the match batting one player short with Nkumar Bonner out injured. Only three other batsmen made it to double figure, Keiran Powell 43 and Chesney Hughes 42 as Volcanoes recorded their first victory by 94 runs. Sebastien took the man of the match award with another four wicket haul (4/67) to go with his exploits in the first two innings. Kyle Mayers and Shane Shillingford has two wickets each. This entry was posted in Headlines and tagged Barbados Pride, Gavin Tonge, Guyana Jaguars, Imran Khan, Jahmar Hamilton, Jamaica Scorpions, Jason Mohammed, Leeward Islands Hurricanes, Liam Sebastien, Nikita Miller, Roston Chase, Shimron Hetmyer, Shivnarine Chanderpaul, Sunil Ambris, Trinidad and Tobago Red Force, Tyrone Theophile, Winward Islands Volcanoes. Bookmark the permalink. Why on Earth hasn’t Nikita Miller played more Test cricket? Will be interesting to see if Rahkeem Cornwall and Kyle Hope can produce in the international environment if provided the opportunity.